Students practicing their fighting skills. Tae = means to jump, kick or smash with the foot. Kwon = means to punch or destroy with the hand or fist. Do = means art, way or method. 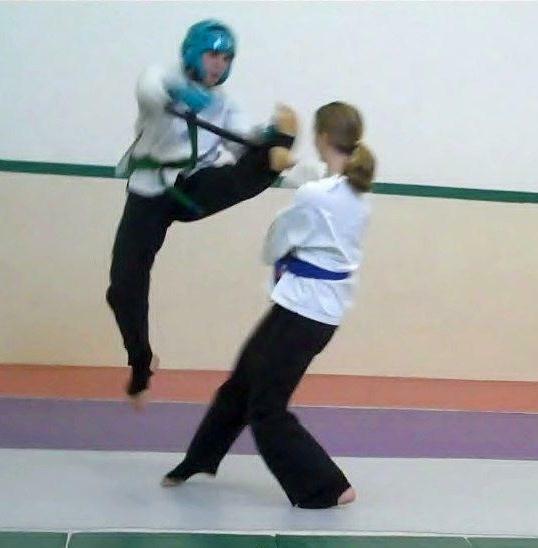 In short taekwondo means the art of the foot and the hand. In reality taekwondo is more about kicking than most other arts and our taekwondo classes reflect this more than others. The taekwondo curriculum we follow is one designed by Master Jose I. Delgado several decades ago. The curriculum is organized into ten levels from beginner to black belt. Each level has a set of kicks, self-defense and sparring techniques selected by Master Jose I. Delgado himself. The curriculum also uses traditional exercises/patterns, better known as forms, to teach some of the more traditional moves. The taekwondo patterns we use are known as the Chang Hon patterns. These patterns are considered to be part of the traditional taekwondo style and are taught by many of today’s most influential taekwondo organizations. While the Chang Hon patterns moves are pretty much the same across many of the taekwondo schools, the interpretation of the same varies from organization to organization. We cannot say that any one school’s interpretation is better than any other; however, Master Delgado’s interpretation is designed to enhance the student’s application effectiveness while reducing the expenditure of energy and the potential counter effects to the student’s body. Advance students are also taught counseling, leadership, anatomy, and martial arts weapons as part of their taekwondo classes. All classes start with a warm-up and stretch session and then a cardiovascular work-out as part of the first 30 minutes of classes. The second half of the class is designed to cover the curriculum assigned for every student. Normally this is the time that we teach techniques and concepts to the students. While classes may be mixed in terms of ages and ranks each student has their own customized learning plan that follows closely the standard curriculum of our school.